This tour fascinates you by experiencing both traditional and urban aspects of Tokyo. Regarding the traditional side, we will visit Asakusa, one of the most popular tourist spot, reach to the Hamarikyu Garden by boat along Sumida River, and then taste Matcha (foamed green tea) ! Let's feel the history of Japan. Also, you can see urban Tokyo by visiting Odaiba to see the Statue of Liberty from Paris, Rainbow Bridge across Tokyo Bay, and Gundam and the Tokyo Tower, the symbol of Tokyo. Go up to Tokyo Tower Obseravatory on foot, experiencing the height of the tower! In short, you have fun things to do on this tour. at 8.30am to 9am picked up at a hotel or apartment in Tokyo except Adachi-ku, Arakawa-ku, Edogawa-ku, Katsushika-ku and Kita-ku. We will let you know the exact pick up time when you request booking. Arrival at Asakusa around 9.40am. Visit the Senso-ji Temple and look around the Nakamise shopping street for 50 minutes. Learn how to pray in Shinto Shrines and get a paper fortune if you wish. Get on Sumida River cruse boat from Asakusa, and enjoy cruising for 30 minutes. at 11.40am reach to Hamarikyu Garden. You will taste a bowl of Matcha (foamed green tea) and beautiful Japanese sweets in the garden that used to be owned by Tokugawa Shogun. Try them in an easy manner (Normally the manner to taste Matcha is very formal). at 12.50 arrival at Odaiba and stay there for 2 hours. 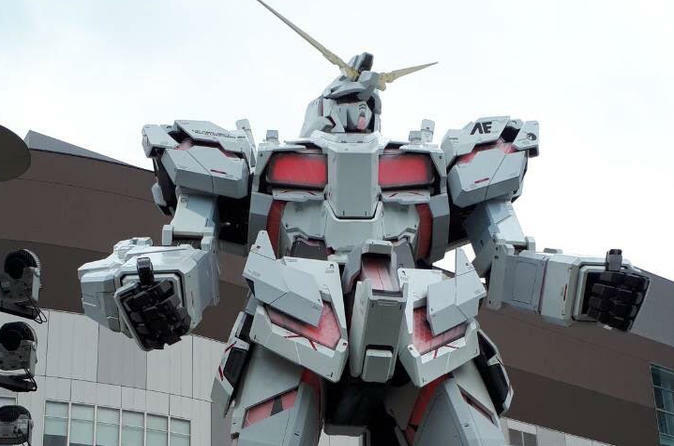 Take photos with the Gundam statue and a replica of the Statue of Liberty. After that, have your own lunch. at 15.20 arrival at the Tokyo Tower. Go up to the observatory on your foots! It takes around 15 minutes. If you do not like or the weather is not good, you take a lift instead. at 17.00 dropped off at Ginza or Shinjuku. The tour is ended.